» liebster blog award #2. » xmas presents for myself. + new hair! » review: one 'n only argan oil. » first week of college?! + notw. 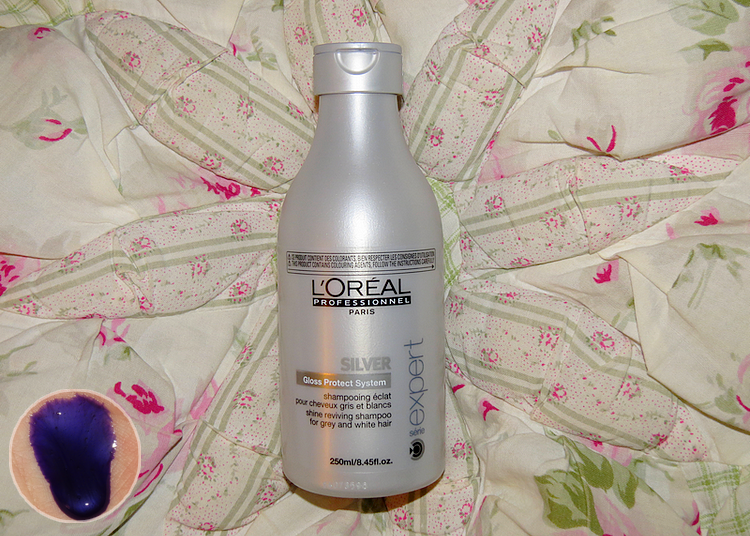 review: l'oreal serie expert silver shampoo. so if you've read/remember this particular post, you'll know that i dyed my hair from a blue-to-silver gradient. obviously, the blue color was going to wash off quickly. i didn't really mind, but i did want to keep the silver/grey in my hair. this shampoo is one of the things i have used to help keep the silver color last longer! available at amazon.com and sears, non-sponsored review. i was a little skeptical about the price and i wasn't sure if i should invest in this shampoo, but i took a chance. and i am glad i did. the first time i used this product, i noticed an immediate change. i still think that it's a bit too pricey, but since you're not supposed to use it all in one week, it should last. also, i couldn't find this shampoo anywhere near me. i checked sally stores and even my local drug stores. i only found this product online. this shampoo is thick (and it's not transparent, like other shampoos are) and it's a dark purple color, as are most silver/purple/blue shampoos, so it might look a little intimidating, but i assure you that it's not. the packaging isn't really all the interesting to look at, but i guess it doesn't really matter to me since it's just shampoo that will spend most of it's time in my shower and i won't be looking at all the time. but, it does give you the impression that it's a safe and simple product to use. it makes you feel like "oh, just a regular old shampoo," which makes up for the weird color. but don't let this fool you. also, if you accidentally pour too much product in your hand, you can't put it back into the container so you can use it another day. you'll have to use it right then and there. and since this shampoo isn't exactly cheap, you'll have to be careful. after i shampoo regularly, i add some of the silver shampoo to the ends of my hair where it's silver. i make sure to evenly distribute the product. then i leave it in for about 3 minutes. however, i will keep it on longer if i haven't used this product on my hair for a week or two. it applies really smoothly, like any regular shampoo, despite how thick it is. after i wash it off, i immediately see the difference it made! the silver in my hair was much brighter and healthier looking! but be warned, you only need to leave this in your hair for no more then 5 minutes. if you leave this on longer, then your can turn purple. you only need to use this shampoo once a week, maybe more if you're hair needs it. but it should last you quite a while. however, this does fade quickly, a little too quickly, for the price. which, i guess, is why you must use it weekly. but i guess toning should also help you out a bit. i am really quite astounded at how quickly i noticed the difference. i expected at least 2 or more washes for there to be change, but 1 wash was all i needed! if you've gone a silver/grey hair color, then i definitely recommend this product! it's like applying toner, only this is waaayyyyy easier. also, if you plan on keeping the silver for a while, i do suggest that you buy the deal package, so avoid breaking your bank. and as i've mentioned, this fades quickly, so you will have to tone your hair probably. here a review i did on ion color brillinace "titanium" dye.